This forum is for anyone interested in discussing domestic architecture: style, interiors, historical development, current technology, new and old world precedent, site planning, geometry, period style applications for a modern lifestyle, gated community covenants, critiques, how to develop a proper design for any size and budget, etc. Post your questions, comments, and experiences here. According to the National Association of Realtors - "82 percent of homes purchased between July 2017 and June 2018 were single-family homes with three bedrooms, two bathrooms, sized at about 1,900 square feet, with a median sold price of $250,000". This is the NAR's model house for 2019. Interestingly the demographics area as follows: married buyers are at 63% of all owners, followed by white female singles. 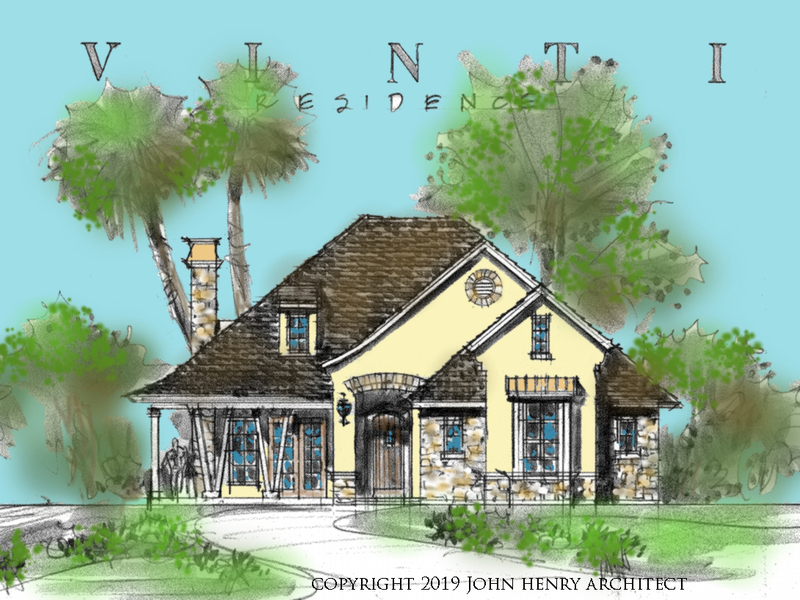 Architect John Henry just developed a new custom suburban house design situated on a corner lot in Central Florida. Setbacks of 5 feet on the back and side, with 15 feet on the two street sides allowed just enough space for this transitional single-story design of 1,980 SF. The lot size allowed a buildable footprint of 50 by 85 feet. The homeowner requested a wrap-around porch for neighborhood views and a friendly image. There are three bedrooms and two baths, a single Living and Dining area with large open Kitchen with bar seats. Laundry and pantry are convenient to the Kitchen and just a few steps off the two car garage. The stunning eye-opener, when first entering under the arched porch, is the amazing amount of light and views under a soaring vaulted ceiling. The wrap-around porch continues into a larger private rear porch ('lanai') that shelters a nice grass yard and Pool with Grill. The Great Room, Kitchen, Dining, and Master Suite all have views into this private area. A fireplace in the roomy Great Room is on axis with the Kitchen, a great visual anchor to the entire open space. The ample covered porch modulates the direct sun and allows cool rocking chair respites on three sides. At the last minute, the homeowner requested an additional bedroom and bath, which pushed the Master Suite to the rear of the setback (not shown). An alternative would be to situate two bedrooms upstairs, allowing this design to be built on an even smaller lot. The owner wished to include some slightly contemporary touches on the architectural treatment outside and although there are stone and stucco, the angled porch columns add that quixotic touch of 'transitional' design. The Fabled Payne Stewart Mansion by John Henry Architect. Created over 20 years ago in a private setting on a pristine lake in Central Florida this is one of the best examples of a contemporary Period Style Mansion in the United States. It is Italian Baroque on one elevation and pure Greek/Roman on the other. This is a beautiful Villa resplendent with characteristic columns, arches, and moldings. But each element has a custom design, and the use of classical proportion and detail make this truly unique and World Class in execution and effect. The interiors were created to be part of the period style. Natural stone was used for exterior and interior columns, balusters, and moldings. The eye delights over the darks and lights, detail and shadow, wood, stone and stucco. Please see the newly created video that includes for the first time: the interiors in still photography and the exterior/grounds in aerial photography. 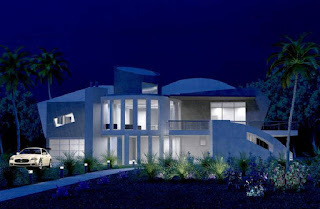 Custom Contemporary Modern Style house ideas, photos and drawings by Architect John Henry based in Orlando Florida. Serving Miami, Ft. Lauderdale, Tampa, Naples, Palm Beach, Jacksonville, Winter Park, and Windermere. TRADE OFFS: What is most important when buying your Dream Home? What are the most important features of an existing property for sale to you, the potential buyer? If you have a young family or are single/living alone the answers would be different from a mature family, empty nesters, or retirees. What is more important to you -- nearby amenities or special aspects about a house or property? Cost for most buyers is a central issue. The selling price of any house is based on location (quality of neighborhood, proximity to key amenities), age (implications for maintenance), and house/property features (size and style, quality of interior finishes, specific layout of plan, views, landscaping). It is very difficult to satisfy everything on your wish list! You may like the location but not the house. Or the house is great but too far out or too close to undesirable properties! So what trade offs are you willing to make? First, what is most dear to you: Time/convenience, Safety, or Comfort and Aesthetics? Good schools in your area? Ideally all three is what we want but not always possible. Let’s look at time for a minute. If you live in a suburb outside of town and commute in every day, a suburban location may not change the time to work but suppose you are selling a house in a potentially more valuable location close to multiple amenities: banks, schools, theaters, restaurants. If you are used to driving or taking public transportation to your favorite Starbucks or restaurant in 10 minutes and now it may take 20 or 30 how are you going to feel about that? Some of us with children are willing to make huge concessions to have them placed in highly regarded and safe schools, even willing to drive a long time each way to them to school and pick them up. A young family is used to minimal comfort and convenience as living costs are high and just a break from apartment living or small rentals is sufficient. Similarly an indigent person or one with medical conditions feels safer closer to a hospital or other medical facilities and can deal with any negatives about the house they are considering. Those with the most options are recent empty nesters. Schooling is done and perhaps they wish to downsize or move to a more advantageous part of town. Or if work and social ties require upscale housing then a gated community or older established part of town may work best. Perhaps building a house is also a consideration. Merchant built subdivisions in suburban areas are one consideration or possibly remodeling an existing house closer in. Perhaps some open tracts are available in a rural setting that fulfill most of the Owner’s interests. Buying an existing house means you will be balancing positives and negatives per your current and possibly long term lifestyle if planning to live in the house indefinitely. If you have to move quickly for financial or other reasons only a built house will work. If you have time (and the temperament) and cannot find the perfect house you may elect to remodel or build anew. You may wish to demolish your existing house and build much larger if your location is ideal and your house will not accommodate your anticipated use by just remodeling. With so many options, check with a Realtor and consult with an Architect to see what is your best route moving forward! You may want to create a chart and weigh each need/wish with a point system and go through several scenarios. Home buying and building can tend towards emotional decision making. Try to think it out clearly and then follow your heart. There are many things to consider when either purchasing an existing house or designing one from scratch. It is easiest to simply walk into a house for sale and move through each room noting the finishes, feel of space, lighting, views, types of furniture (if staged) that can fit best, etc. Outdoor spaces, shade, breezes, sun angles are also evident. With so much sensual information available (even characteristic odors due to age or even water damage) the buyer can make a quick assessment of whether the property will do or not. And then it is the singular feature that grabs them emotionally: the incredible picture window, the amazing kitchen, the amount of storage, the size of the master suite and bath, the great views, etc. Even though one may be smitten by several aspects of a property the potential buyer needs to become coldly analytical about the great commitment they are about to undertake. Location, the age of the home, possible insect infestation, ground movement, drainage, structural integrity, and other items including cost comparisons and mortgage facts and more should be factored into the buying decision. Important to imagine is how the buyer will actually use the house day-to-day. What is the route he/she will take from exiting the car with groceries to the kitchen? Does the Dining area accommodate the family and guests or is it taking advantage of any views – is it open to other spaces or isolated? Is the Kitchen open sufficiently to work and converse with family – is it dark or brightly lit? Is the Master Suite too close to children play areas, does it have enough closet space, are the counters sufficient for cosmetics, is it on the quiet side of the property, does it get direct light in the morning? Are closets throughout the house large enough, is there space in the garage for lawn mowers, storage boxes, and tools? Is the laundry room sufficiently large for your family’s needs? Are split level floors going to be a hazard to you in coming years? Would you have preferred a single story plan in the end rather than two-story? If the climate is wet most of the year will you damage a hardwood floor coming in and out of the house? Is the roof simple or complex possibly needing attention if hard rains or heavy snows stress the tile or rafters? If nearby trees are large and shady will they pose a hazard in high winds? What is the condition of the driveway; will potential repairs to the house mean that heavy equipment will damage it? Of course, I cannot itemize every possible contingency but you should get the picture: consider your lifestyle and day to day living with the family you have now and how long you plan to live in the house. So I suggest: LIVE WITH THE PLAN. 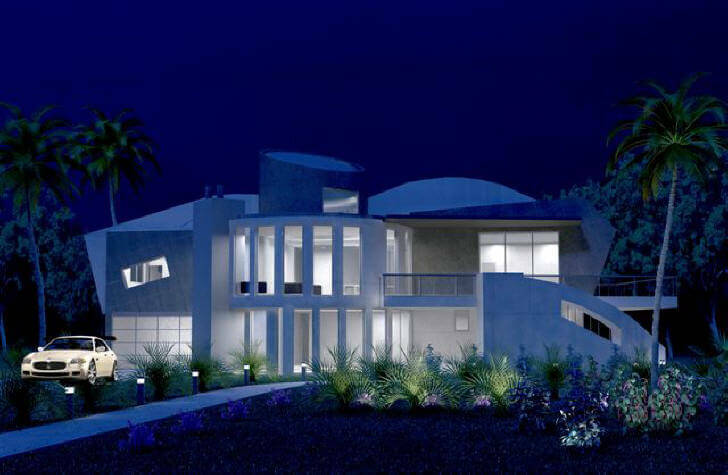 Study the design of the house and how it is sited on the property. Go through several scenarios in your mind how you will utilize an existing house. 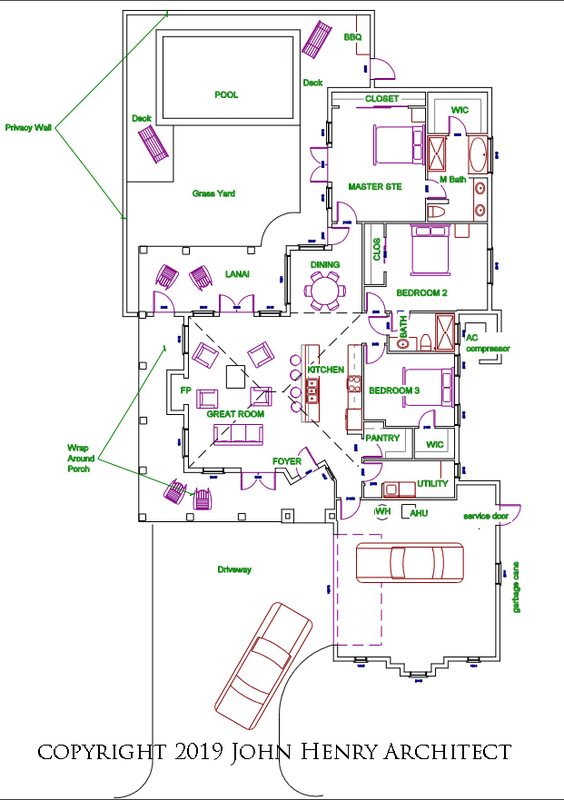 Get a floor plan layout from the Realtor and write notes as you move from room to room. Measure the sizes of some of the largest pieces of furniture you own and check them on the floor plan. If you plan to remodel cosmetically your attention and considerations are different from possible structural wall changes and additions. 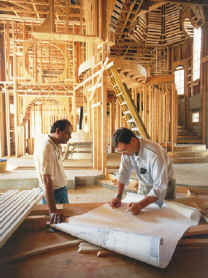 Seek a building professional to verify what you have in mind can be done. When working with an architect or builder on a new design from scratch most of the above considerations must be addressed as well. You do not have the luxury of visiting the house as built; you cannot move through spaces; you cannot sense the sizes of rooms and lighting or views. So even more important now: LIVE WITH THE PLAN. Take all the time you need to imagine as best as possible how a new design will work specifically for you and your family. Is the overall design aesthetic pleasing, even inspirational? Does it make a statement about who you are or what you aspire towards? Does it present the right effect upon entering? Are there some things that should be visible and others hidden from view? Are corridors short enough or interesting through the openings that are presented on either side that their length does not matter? Is the kitchen triangle laid out well in order to keep footsteps minimized? Will the location of the home theater bother others who may not be watching movies? Does the rear porch have ample room for chairs and possibly a grill and does it extend sufficiently to shade well? While renderings of interior spaces and computer walkthroughs may offer detailed and realistic depictions of the space, these are done at the end of the design process and may be too late as a check on the usability of spaces. So you must LIVE WITH THE PLAN in a two-dimensional aspect and compare with your existing residence, even measuring out floor space to judge better. Note also the width of doors: standard widths from yesteryear may be stifling and if you think you might be using a wheelchair make sure that ADA compatible baths and other spaces are designed with a look towards the future. Finding an existing house that fits your needs and aspirations perfectly is a difficult task but it is the easiest and most direct way to check your lifestyle and requirements with a fully 3D and operational property. You know exactly what you are going to get by observing every aspect of an existing house. Again, be diligent to avoid missing items small or large that may be difficult to remedy later. Starting from scratch on paper is a huge leap of faith. There is nothing to walk through, only a dream that must be fleshed out methodically. It takes time to plan and time to build. You must be prepared to concentrate on every aspect of the design -- from general layout and aesthetics to finish details and specification. LIVING WITH THE PLAN in either scenario means that you should make the best decisions in a calculated method in order to Make Sure Your Dream Home is Right for You. Once upon a time there was a tramp walking through a deep forest. He made his living selling a little bit of this and a little bit of that. Now he was cold and tired and hungry and what was even worse, he had nothing left to sell. All he owned were the ragged clothes he wore and an old, bent nail. When he came out of the forest he saw a little cottage, with smoke rising from the chimney. He knocked on the door, the door opened and a woman looked at him suspiciously. - Please, could you be as good as to give a poor man shelter for the night, he asked. - I know your kind, she said, if I let you in you won´t leave before you have eaten everything I have. And I tell you, I´m so poor I haven´t had a bite for three days. So you just go away! But the tramp was a clever fellow, and the woman was so greedy that she immediately invited him when he said that of course he didn´t want to eat the little she had. On the contrary, he wanted her to share his evening meal. - But first I want to see the food you say you want to share, she said. - This is all I need, he said, and took an old, bent nail out of his pocket. Just bring me a pot and some water, and I´ll cook the best soup you ever tasted with this nail. The woman brought a pot and looked with amazement as the tramp made a fire, cooked some water and dropped the nail in it. - The soup might be a little thin, he said, you see I have been using the nail for seven days now. It is a pity you don´t have a little salt, that would surely make the soup taste like a soup fit for any gentleman´s house. But what we lack, we don´t have. - Now that I come to think of it, said the woman. I might have a little salt left since Christmas. - How lucky, said the tramp and put the salt in the pot. Well I was thinking that perhaps you could even serve this soup to the priest, if we only had some vegetables also. But what we lack, we don´t have. - Now that I come to think of it, said the woman. I might have some vegetables in the cellar. The tramp praised the wisdom of the woman and the excellent taste of the soup. - I think it would even be fit to serve the king, if we only had a little meat to add, said the tramp. But there is no use longing for the impossible. What we lack, we don´t have. - Now that I come to think of it, said the woman. There might be some dried meat left somewhere. The tramp happily added the meat to the by now sweet-smelling soup, the woman made the table with her finest silver spoons and her best plates. When she came to think of it, there was actually some wine left since her husband´s funeral. My formative years were spent in Europe and the Middle East (Turkey). I love the cities and architecture of the Old World and classical architecture from antiquity through 1940. Modernist education exposed me to think with function in mind and technical precision -- I am happy to break with tradition if asked. I can think in both modes and offer a perfectly integrated execution.